We need Volunteers for 2019! 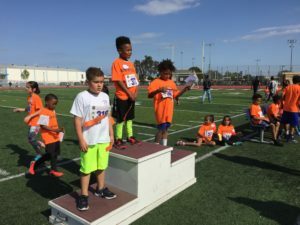 The 2018 Citywide Youth Track and Field Meet was canceled this year because of a lack of volunteers. Quite frankly, the SLSF core group is getting on in years and it’s time for new blood. It’s our hope that a new generation of San Leandrans will step up to the plate (an app sports metaphor) and keep this iconic event going for 2019 and beyond. 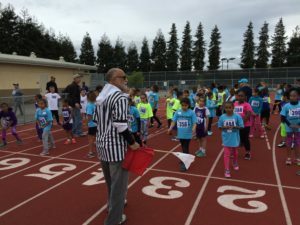 The citywide youth track meet is an iconic community event that first started in the late 50’s. Our children need more opportunities to participate in fun, healthy events that foster the development of healthy habits early in life. The obesity epidemic in this country affects everyone and playing is the best way for children to learn that exercise is not only fun, but good for them, too. With your help, we can provide a safe, supervised environment for kids to have a healthy good time. Over 200 grade school students race, jump and laugh while being cheered on by hundreds of family members. 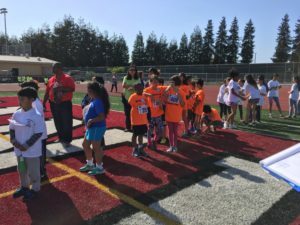 San Leandro Sports Foundation, a 501(c)(3), a non-profit organization, (federal tax ID# 26-3679203) is proud to have hosted this event for the past 4 years for the community in partnership with the City of San Leandro, the San Leandro Unified School District and the San Leandro Chamber of Commerce.